Classically Liberal: Another IPCC scandal is fully exposed. On Dec 24th, 2009, this blog reported on a scandal that was brewing within the exclusive club of hysterics known as the InterGOVERNMENTAL Panel on Climate Change. The IPCC had reported, as highly probably, that the glaciers in the Himalayas would melt, due to global warming, by the year 2035. Expert glaciologists said the claims were total rubbish. But the IPCC was refusing to back down. The head of the IPCC, who has no degrees in the fields over which he presides, launched some very public attacks on people who actually are experts on glaciers because they were challenging settled climate dogma—I mean theory. This blog said that the evidence used by the IPCC was bogus. None of it was based on peer-reviewed papers, contrary to IPCC rules. And we noted that the IPCC “expert reviewer” responsible, Murari Lal, cited several sources for this startling claim—not a one of them considered a legitimate scientific source. He quoted a claim by World Wildlife Fund, another by UNESCO and a brief mention in an article in New Scientist. None of these had peer review or were legitimate sources for the purposes to which the IPCC put them. I stand by that assessment. And now we learn more including that the IPCC may withdraw this bogus claim entirely. So much the settled science and consensus, at least when it comes to glaciers in the Himalayas. Lal is trying to excuse his bogus claims, published by the IPCC as fact. He says: “I am not an expert on glaciers and I have not visited the region so I have to rely on credible published research. The comments in the WWF report were made by a respected Indian scientist and it was reasonable to assume he knew what he was talking about.” So, Lal admits he published this extreme claim about glaciers on nothing more than the hearsay report from a political lobbying group like the World Wildlife Fund. There was no attempt to verify the claim, there was no scientific data investigated, no peer reviewed reports read. It was published simply because one IPCC office “assumed” it must be right. Why that assumption? Because skepticism is discouraged by the IPCC. I have argued that the IPCC is acting like cops and prosecutors who are convinced they got the culprit in some horrendous crime. Because they are so sure they ignore evidence to the contrary and anything that appears to point in the direction of their “suspect” is lauded as being all the proof they need. Once you are so sure you have it right you simply grab anything that seems to verify your case while routinely ignoring everything that doesn’t. I believe that this is what was behind the IPCC publishing entirely fictitious statements about the glaciers in the Himalayas. The London Times now reports that the IPCC is on the verge of withdrawing the claim. The Times also wonders, as do I, why someone with no expertise in the field of glaciers “was overseeing such a report.” So much for having experts at the IPCC acting as the gatekeepers for what is, and isn’t acceptable climate science. 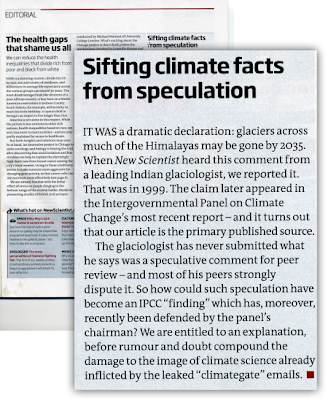 They report that New Scientist ran an article, not a scientific paper, which was entirely based on a “short telephone interview” with Syed Hasnain, “a little-know Indian scientist.” Hasnain had no scientific research to back up his thought on the glaciers. He has admitted it was entirely “speculation.” Now Lal says: “If Hasnain asserted this, or that it is a wrong presumption, then I will recommend that the assertion about Himalayan glaciers be removed from future IPCC assessments.” Consider that Lal seems to be saying that an outright refutation from the original source is necessary to remove the claim but that absolutely no scientific research was needed to include it in the first place. As controversy about these absurd claims were circulating the author of the original article in New Scientist, Fred Pearce, came forward with some additional facts. He said: “Hasnain told me that the was bring a report containing those numbers to Britain. The report had not been peer reviewed or formally published in a scientific journal and it had no formal status so I reported his work on that basis.” It had no “formal status” at all but it confirmed the scare mongering of the politicians who run the IPCC and that was just good enough for them. Pearce says that since then he obtained an actual copy of the report and discovered “it does not say what Hasnain said.” The date 2035 was entirely absent and the report only discussed some glaciers not the entire range of glaciers. Let us pause to recap this. A scientist, using pure speculation, makes an off-the-cuff claim to a reporter. It is allegedly based on a paper that was never subjected to scientific scrutiny. But it doesn’t matter since even the paper didn’t substantiate the off-the-cuff remark. That remark is then taken by a lobbying group and publicized a few years later, as if it were fact. At this point the pure speculative, off-the-cuff, inaccurate portrayal of a paper that was never subjected to scrutiny, is picked up by a IPCC author who is writing about a field of which, by his own admission, he knows very little and is no expert. Once it appears in the IPCC report it is then treated as global warming gospel. Just remember this the next time someone cites the IPCC report as an impeccable example of science at work. I never thought that myself. I considered it an impeccable example of how politicized science works and this sorry affair seems to support that assertion. In the world of politics you don’t need science, all you need are speculative assertions made without foundation and spread by political lobbyists. That is certainly what we got here. UPDATE: Here is how New Science, the source of the IPCC claim, has editorialized on the matter. They aren't happy. Click to enlarge. And HOLD YOUR HORSES IT GETS WORSE. Get this: the source for the false claim was Syed Hasnain, who used pure speculation as the basis for his remarks. The IPCC spreads these remarks as if they are proven science. The head of the IPCC is a bureaucrat, with no credentials in climatology named Rajendra Pachauri. For my take on Pachauri go here. Pachauri, who has been called a leading climate expert by left-wing publications, studied economics and industrial engineering. He does have business interestes, however, in alternative energy, a field bolstered by warming hysteria. When Hasnain's speculation was being questioned by leading experts in the field, Pachauri was very vocal in defending the bogus claims. He went on the attack against anyone questioning Hasnain. Along with running the IPCC, Pachauri is a director of something called The Energy Research Institute. It appears that Hasnain, the source for the false allegation about the glaciers, is actually employed by Pachauri's TERI. Using the IPCC claims of a Himilayan crisis TERI went to the Carneige Corporation to seek funding for "research, analysis and training on water-related security and humanitarian challenges to South Asia posed by melting Himilaya glaciers." They received $500,000 for that research. With that money Pachauri set up a team a TERI headed by Hasnain. How incestuous! So, Hasnain invents a "speculation." Pachauri's IPCC uses the speculation and reports it as fact. With IPCC backing of the speculation, Pachauri seeks, and receives half a million dollars to set up a project to "study" the problem that Hasnain speculated into existence. And then Hasnain is hired by Pachauri to lead the project. How very convenient for both of them. This is the ethics of the man heading the IPCC. And things may get very hot for Pachauri, not just because of the scandals brewing under his watch at the IPCC, but with TERI as well. The Times of India is reporting that TERI is being subjected to "due diligence" by the British Department of Internation Development. Apparently the British government had given 10 million pounds to TERI and now is questioning Pachuri who "enjoys a lavish lifestyle; his Delhi home is in the Golf Links area, the most expensive stretch of residetial real estate in India, and he is famous for his $1,000 suits." The more scrutiny the IPCC gets the more it stinks. So, to recap: in the course of a garbled phone conversation a scientist accidentally invents a problem that doesn’t exist. This gets reported as if gospel in an influential Warmist science magazine and repeated by a Warmist NGO, before being lent the full authority of the IPCC’s fourth assessment report which, as we know, can’t be wrong because it is vetted by around 2,500 scientists. Then, on the back of this untrue story, the scientist gets a cushy job at the institution whose director is also in charge of the IPCC. If you want some idea of how TERI Europe, which Pachauri is a director of as well, is hiding revenue from scrutiny read this enlightening article also in the Telegraph. It is said that fish rots from the head down, I don't know if that is true, but it sure seems the IPCC does. 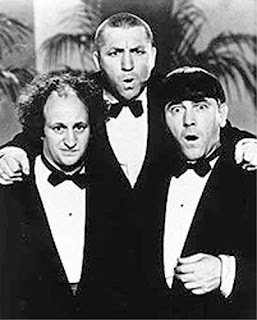 Photo: IPCC experts at work. posted by blog owner at 1/19/2010 09:03:00 AM DiggIt! Reddit Del.icio.us Slashdot It!